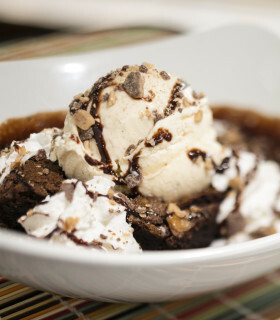 Rich chocolate brownie, covered with Heath Bar candy pieces, served warm, with vanilla bean ice cream, real whipped cream and chocolate syrup. Definitely for sharing! A twist on a classic. Graham cracker crust topped with chocolate soaked brioche bread and a marshmallow topping. Granny Smith apples and raisins, baked in a light strudel, topped with cinnamon brown sugar ice cream. A smaller version of our monster brownie. 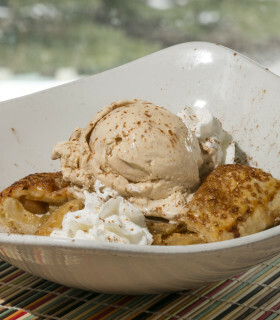 Granny Smith apples and raisins, baked in a light strudel and topped with cinnamon brown sugar ice cream. Ask your server about our rotating daily cheesecake. Lots of seasonal fun flavors like Egg Nog Rum Cheesecake! A big ol’ mug of root beer with vanilla bean ice cream. Vanilla bean ice cream or cinnamon brown sugar ice cream topped with chocolate sauce and whipped cream. A pint of Dam Beer with a scoop of vanilla ice cream in it! 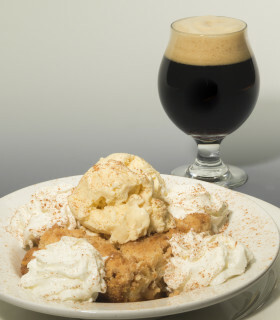 Best with our McLuhr’s Irish Stout or maybe a seasonal beer.